We have a love/hate relationship with our robot vacuums. Our Roomba mostly works OK (apart from the persistent beaching events), but the Neato is affectionately* named “Help Me” because of how much intervention is required to actually get it to complete a run. Some of this comes down to the underwhelming intelligence in the device, and some of it is, for reasons that I cannot understand, that my children can’t seem to hit the hamper consistently. While this is clearly a place where more user training is required, it would be fantastic if our smart vacuums were, um, smarter. The other main gripe, and this applies to both, is that there isn’t a smart way to train it not to go certain places. Neato’s story here is a bit better than the Roomba, with only a bit of magnetic strip required. But the Roomba, which maps the floor, still requires a powered light wall to block off an entry. The Ecovacs DEEBOT OZMO 930 claims to address both of these issues. One by mapping your home (like the Roomba), but after it’s done you can cordon off sections virtually. The other, is that it has an AI (branded AIVI) engine which recognizes objects, like socks and slippers, which aren’t rubbish (in the general sense, my son’s socks are best left to the biohazard squad) so it avoids eating them. 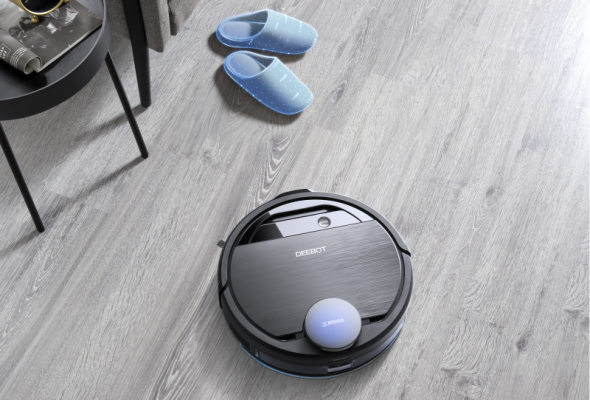 Naturally the proof of these claims needs some testing, but the demo was very slick, so I have hope that someday, perhaps in the not too distant future, our relationship with the robot vacuum will just be one of love. If this bot can pick up the dog hair from our two Shepherds (1 long-haired, 1 short-haired) better than the ridiculousness that is the Roomba 960, as well as avoid the occasional “accident” in the house, I’ll be on-board. As much as I don’t like the damage our Neato does to area rugs, furniture, and speakers, it’s the only one capable of actually VACUUMING up the dog hair from our rugs. Even the newest Roomba i7 (that Ferrari-priced bot that can empty itself) uses the same terrible brush setup which leaves clumps and trails all over the floor. Can’t wait to see some reviews of this new DEEBOT. Andy, any chance we can get a review unit? Wow, that’s terrible! Our Roomba does OK with our dogs’ fur, but it is certainly less robust than the Neato.